The development control and planning law system of the United Kingdom is one of the most comprehensive and detailed in the world. Development control is one of the most significant matters concerning anyone involved in the development of land, and an understanding of the legislation and enforcement of these powers is essential to the success of any development project. This book is the fourth edition of a highly regarded work widely used by students and practitioners of real estate management, development, surveying, valuation, planning and law. 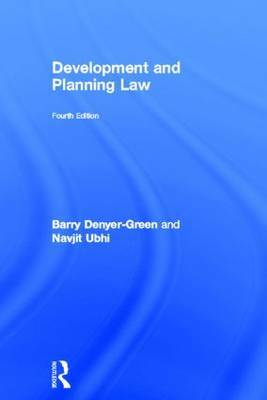 Written by two experienced experts on law and the UK planning system, Development and Planning Law is essential reading for anyone involved in building and construction, surveying, planning and development, and who needs to know the law as it relates to their everyday professional practice. It has been extensively updated to reflect the most recent legal developments, including the 2011 Localism Act.